Till a week ago, a group of artists from Kerala dazzled at Durbar Hall Art Gallery in Kochi at the Cochin Art Show. 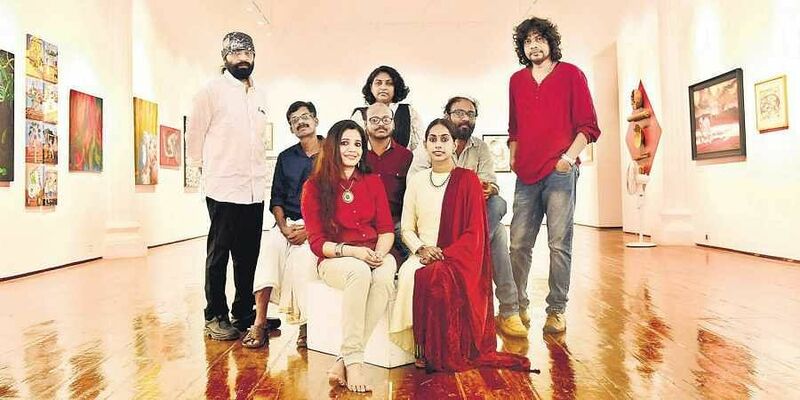 Till a week ago, a group of artists from Kerala dazzled at Durbar Hall Art Gallery in Kochi at the Cochin Art Show. On its white walls was displayed a feast for the eyes: 52 works using a variety of mediums such as acrylic, charcoal, oil and watercolours. The work was a collective coming of age of perennial artistic concerns over individual liberty and freedom, ecological disaster and dose of truth in nostalgia. The third edition of the show concluded on September 30. Biju Bhaskar is one such artist who chose to recreate his childhood in the 1980s on a pastoral canvas. One morning, as dawn filtered in through his bedroom window in Muvattupuzha, he woke up, but kept his eyes closed, staring at a scene unfolding in his imagination. It was a visual from his village Pothanikad. “Life was simple then, there were no walls between houses, just hedges, and people used to interact more. Now, they live in cities and have no relationship with their neighbours,” he laments. Biju got to work. The outcome was the portrayal of a Malayalee wedding. It shows a newly-married couple holding garlands surrounded by relatives, protected from the sun by an umbrella. Just a few feet away, a photographer with a towel draped over his head is peering into his camera on a tripod. Nostalgia makes for good art. So does contrast. Next to Biju’s was a series of 1 x 1 ½ feet canvases by Anil KV. A boy and a girl flying a kite as an aircraft passes above them. Another depicts a group of boys catching crabs in the backwaters while an oil tanker cruises in the backdrop. Artist Shinoj Chooran’s water colour titled ‘Under the shadow of democracy’ shows dozens of barefeet men standing in line, wearing similar uniform with a cloth bag over their heads. An Ashoka Chakra can be seen on the side. Shinoj’s works have acquired distinctive political overtones in the past few years. “I wish to convey that we are steadily losing our freedom,” he says. Shinoj has found an eminent companion on the walls of the gallery. Kochi Biennale founder Bose Krishnamachari’s work called ‘Forgetting is not as the same as not remembering’ is a statement of inquiry, explaining the insight into Indian nationalism, from the 1940s to the present day.Art is also the notary of the present. Narayanan Mohanan’s work ‘(Re)Build’ on the Kerala floods stresses environment protection.